Coloplast Sween Cream, manufactured by Coloplast, is a vitamin enriched cream designed for soothing irritated skin. Lotions and creams are used to soothe, protect and moisturize the skin. Common skin conditions can cause burning, itching and irritation. Left untreated these symptoms can prolong the skin discomfort and advance to more serious skin conditions. The use of a skin lotion or cream helps to provide temporary relief and protection of these symptoms. Coloplast Sween Cream is available for SALE from Vitality Medical. This cream is enriched with the natural vitamins A and D. These vitamins can help to reduce dry, chafed or chapped skin and rebuild damaged skin tissue. Keeping skin moisturized with the right vitamins can help speed up the damaged skin healing process and provide soothing temporary relief. This product features a non-occlusive formula which allows air to circulate around the skin allowing the skin to breathe. Some types of skin moisturizing products can leave an occlusive layer which does not allow the skin to breathe. This can lead to further discomfort and irritation of the skin condition. An additional benefit of the Coloplast Sween Cream is it's ability to not interfere with tape adhesion. This means that bandages and tape will still stick to the skin after the cream is applied. Allowing you to be able to apply your wound dressing as you want to. According to Coloplast Sween Cream is safe for neonatal use which could be useful for effectively treating diaper rash. CHG compatible and available in various sizes to fit your needs. 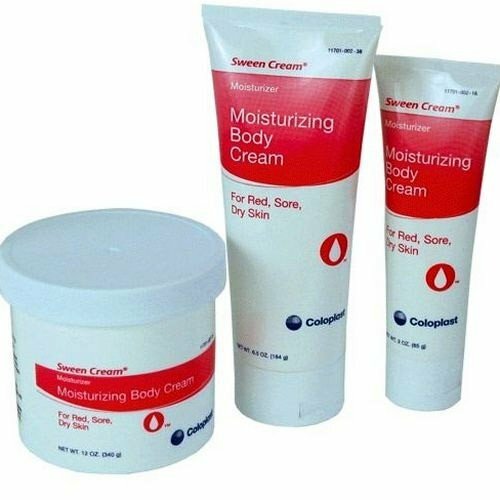 BUY Coloplast Sween Cream from Vitality Medical today. Best all purpose cream ever! Started using sween cream years ago for adult heat rash. Have been using it ever since for rashes, dry skin, etc. Great product at a reasonable price. In hospital - requested lotion. sween cream is the first cream that my family member I take care of did not conplain that it burned his bottom! Wonderful product for skin irritations and dryness.also good for people who are incontinent, it leaves their bottoms feeling comfortable with no burning even in the most sensitive areas. Learned about this cream when my wife was in her final days. Hospice recommended it for anti-bed sores. Discovered that when I applied it to her, I also lost the cracks in my hands. Eight months after she a passed and I begin to get vain again, I tried it on my face to get rid of the lines, and it really worked. Got rid of the wrinkles, also. Have used it ever since. My husband uses this cream daily for his very dry skin. It works! I apply this product on minor skin problems I have. For minor burns I put some of it so that the skin will not swell. I put it on shallow lacerations. I put it on callouses. I even put it after I shave! A great way to moisturize the skin. Smells organic. This product has been recommended to me by my friend. I found it effective when used in treating my callouses. It made the callouses less sore and the redness was lessened. Today, I still keep this product in my medicine box in case of any skin irritations that needs treatment and remedy. This is the lowest price that I found on the web. Thanks Vitality Medical. Sween Cream is the best! My mother, a 93 year old (17 year colonostomy patient) was given Sween Cream by an ostomy nurse many years ago. She finally told me that it was the only product that ever helped her, so I got on line and found the company on the internet. I placed my order, and she received it in just two days. Thank you, Vitality Medical for your quick service and wonderful product!